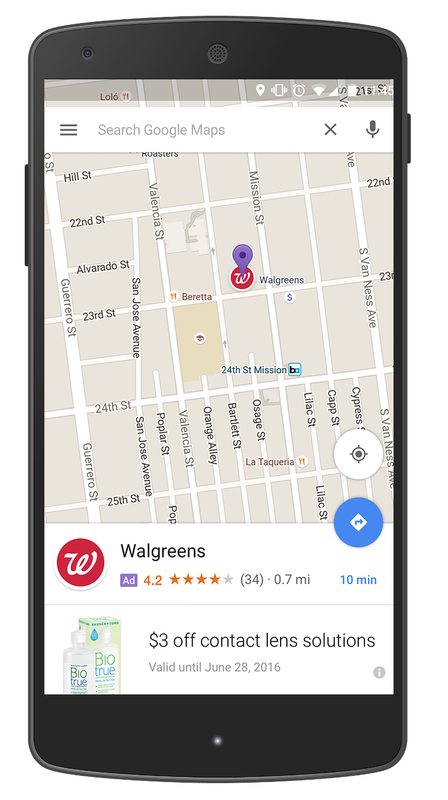 Google is introducing ads that will pop up in search results in Google Maps. Pins marking advertisers' locations will also pop up directly on the map portion of the results screen. Google announced this in their blog post yesterday. Google is calling this a push for the mobile first world. These are what Google calls "promoted pins," or companies that paid to appear in your map. Logos would appear as you look at a map, or could show up in your driving route suggested by Maps. For example, the logo for Walgreens may appear as you follow on-screen directions from your office to a meeting. The business page, which appears at the bottom of the screen when you tap on a logo, could display coupons for items at that store or let you browse the store’s inventory. Someone searching in Maps for a burger joint, hospitals or opticians, for example, will see ads for specific burger places, hospitals or opticians on top the list of results. The 'promoted pins' can also appear in the app's navigation mode, which adds to the on-screen directions with audio instructions. 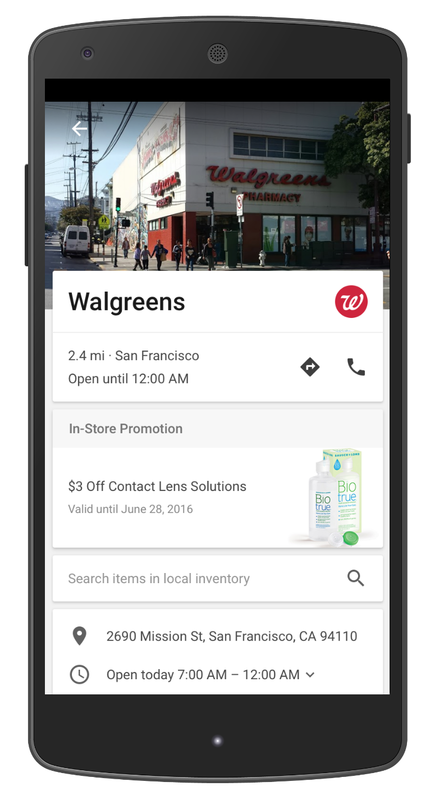 Navigation ads will be visual only, not spoken. The new opportunity gives advertisers, retailers in particular, a way to increase their mobile advertising as it relates to both search and navigation. Fast food companies, for example, will find good value in buying promoted pins in areas that have a lot of lunch time traffic. 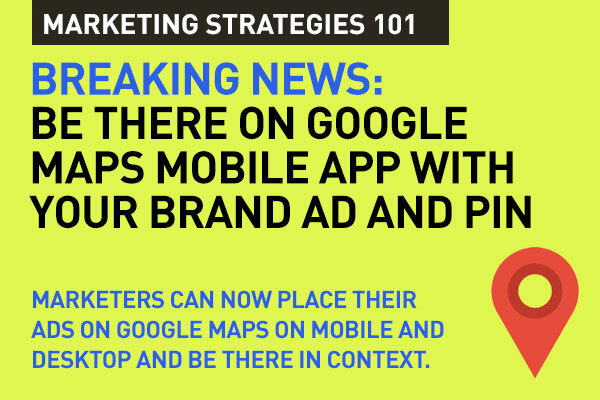 Advertisers will also have the option to not just advertise the location, but more details as well. Tapping a promoted pin will bring up a "business" page with offers and promotions at that location, as well as information already available for many locations in Google Maps such as address and hours. 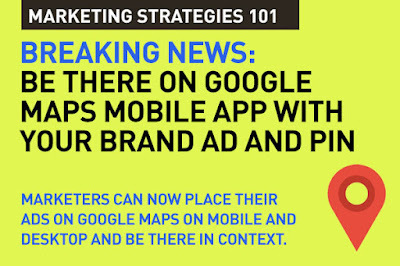 This extends the power of location based marketing combined with Search. Search results in maps will start including more prominent ads for local businesses. This means that when you type something like "Pub near me" into your Google Maps app search bar, a pub that paid for an ad would appear first in your search results list. This business would be identified as an ad using a small, purple box and the word "Ad," and its related location on the map would be marked with a purple box. Apparently, these ads will also be visible on desktop versions of Maps. The Google post says "Google Maps shows search ads in two places: within the search results list beneath the search box, and on the map. Ad locations appear on the map with a purple icon and business name. If someone clicks the purple icon or your ad in the search box, your ad will expand to show details about your business. Your ad may also have a Directions button, so someone can easily get directions to your business." This reflects Google's clear focus on mobile. Sridhar Ramaswamy, senior VP-ads and commerce at Google, said this year is "all about mobile." Unlike previous years "of mobile," when people anticipated wide adoption, 2016 is about offering products to advertisers when that adoption has already happened, he said. "It's clear to all the advertisers that mobile is something that's already here," Ramaswamy said. "It is the mainstream." "Trillions" of web searches happen every year, half of them on smartphones, he added. Nearly one-third of mobile searches on Google are related to location, according to Google, Google said, with location-related mobile searches growing 50% faster than all mobile searches. Google really believes that we are in a world driven by 'micro moments'. Google has defined four key moments when we are online. When a need arises, consumers quickly turn to Search on, say a Google and a YouTube to find a resolution to that need. These needs arise when a consumer wants to know something, wants to go somewhere (on a holiday, to a restaurant, to a business location), wants to do something and wants to buy something. Simply put, these are the four basic need states that digital marketing needs to answer. Read this if you want to know more about Search Marketing: Search Made Simple. That's really quite a bit of opportunity right there with this new Google push, because Maps is something we all use – almost on a daily basis. That's good thinking, and that's the basics of good strategy. That's Digital Marketing Strategies 101. Great news for retailers and local businesses. I really appreciate this short information which you uploaded above. It’s of nice help. If someone want to services regarding add posting in india like local classified ads or other types of posting free services then kindly contact us. We provide professional services. fnads.com has successfully conducted 1000+ etc. Please explore this site and visit.